I love pub food, always have. Sure, it’s not the healthiest option but sometimes you have to treat yourself, life’s too short. 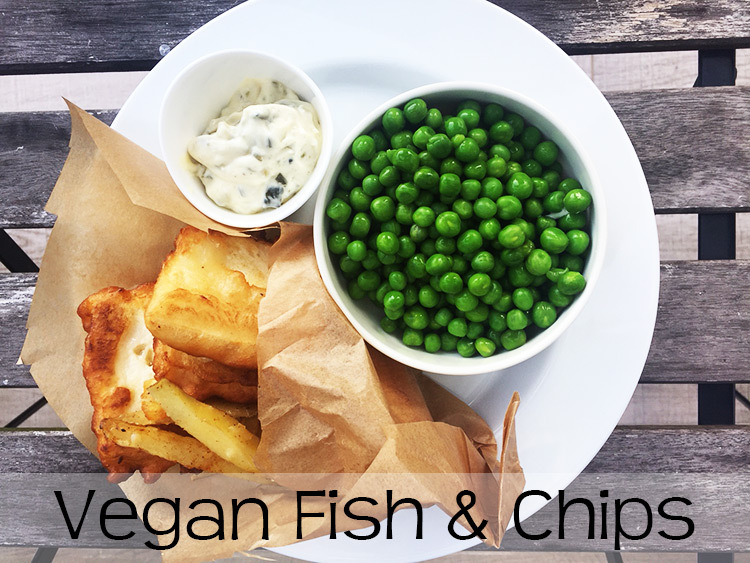 This plant-based take on the classic fish and chips will leave your taste buds craving more and it is the perfect meal to serve when you feel like you want to incorporate some of that pub-feeling at home. 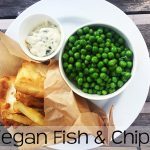 Since fish is not vegan (duh), I’m using tofu to create the “fish” in this vegan fish and chips recipe. It’s important that you use firm or even better, extra firm tofu. I tried using soft tofu and silken tofu but with disastrous results. So go for the firm alternative. The batter is a classic beer batter, but you could replace the beer with sparkling water if you’re not too fond of beer (I recommend you to try however, it really gives the fillets an extra layer). As for the sauce, I whipped up a quick and easy tartar sauce using egg-free mayonnaise, gherkins, Dijon mustard and some salt and pepper. I prefer peanut oil when I deep fry things, it has a nice taste to it and it also keeps the heat very good, making it ideal for frying. If you’re allergic to nuts you can choose another oil, but try to stay away from olive oil. In my opinion, it takes far to much space taste-wise. First up you need to cut the tofu in to “fillets”, that’s quite straightforward. Just make sure you don’t cut them too thin, keep them about 1 1/2 cm (~1/2″) thick. 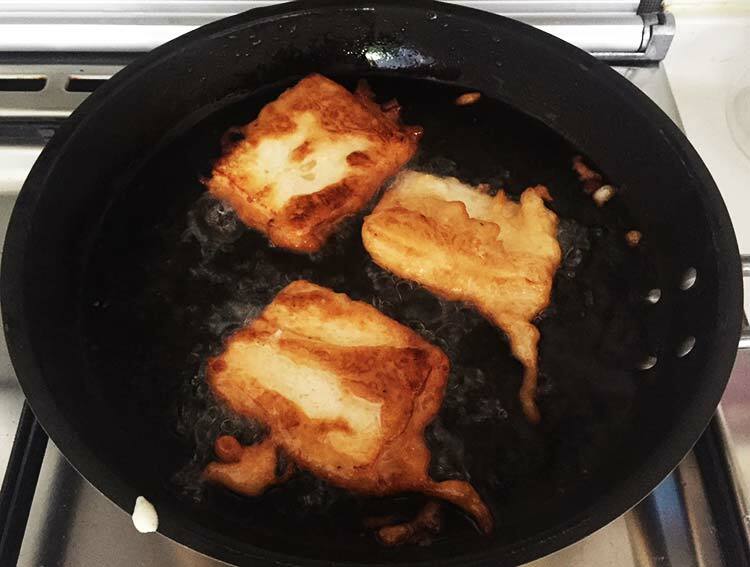 Now place your fillets in a deep frying pan and cover them with water, squeeze in the lemon juice and add the salt. Bring this to a boil then quickly lower the heat and let it simmer for about 15 minutes, then turn off the heat and let it rest in the water for another 15 minutes or so. Don’t worry if the tofu slices overlap each other. While the tofu is simmering, prepare the batter. Combine flour, salt, pepper, baking powder in a bowl and mix until everything is combined. Then pour in the beer and stir until you have a thick smooth batter. Let the batter rest for about 30 minutes at room temperature, in the meantime, you can start preparing the chips and tartar sauce. Making the chips is easy. Pre-heat the oven to 225° C / 450° F / Gas Mark 7. Cut the potatoes in the shape of sticks, grease up an oven-safe form and then season them with salt, pepper, paprika and chilli. You can season them with the spices you find good here, be creative. Pop them in the oven and bake for about 30 minutes, or until they start to get golden brown. Make sure you stir every once in a while to prevent them from sticking. Last but not least, you have to prepare the tartar sauce. Just whip all the ingredients together and let the sauce rest in the refrigerator until it’s time to serve. While the chips are in the oven it’s time to start frying. Grab a deep frying pan and fill it up with a lot of oil and turn on the heat. You can test if the oil is hot enough by dripping in a drop of the batter. If it starts to sizzle and the batter turns brown in about 50 seconds or so, it’s ready. Take a “fillet” and dip it in the batter so that it is completely covered, then carefully slip it into the oil. You want to make this in an “away from you” motion to avoid the oil from splashing on your fingers and arms. It’s HOT, so be careful. Flip the “fillet” over and put on a piece of paper when both sides are golden brown. Repeat the process with the rest of the tofu and then serve immediately with some fresh green peas. Enjoy this with a pint and some friends and I can guarantee that it will be a success! If you liked this recipe, please share it! That would make me so happy! Also, let me know what you thought of it, either in the comments below or on my social media pages. 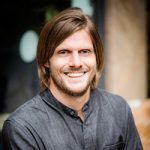 You find me on Facebook, Twitter, Google+, Pinterest and Instagram. 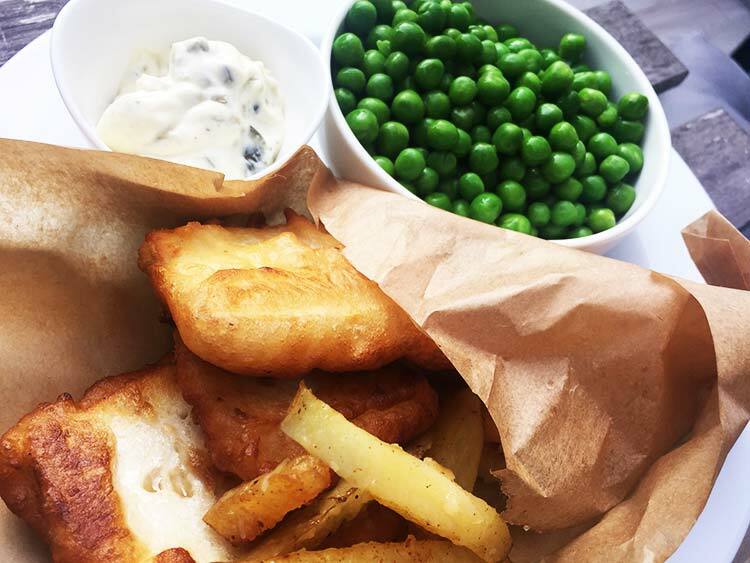 Vegan Fish and Chips, the classic pub comfort food made vegan. Cut the tofu blocks into "fillets", make sure you don't cut them too thin. Aim for 1 1/2 cm (~1/2"). Put all the tofu in a large pan and cover them with water. Squeeze out all the juice from the lemon and add some salt. Bring to a boil, then lower the heat and let simmer for 15 minutes. After 15 minutes remove from heat and let rest in the water for another 15 minutes. While the tofu is simmering, prepare the chips. Cut the potatoes into sticks and put them in a greased up oven-safe form, and season them with the spices. Pop it in the oven and bake for about 30 minutes or until golden brown. Now it's time to whisk together the batter. Take all the dry ingredients and mix them together in a medium bowl, then pour in the beer and whisk until you have a smooth and kind of thick batter. Put it aside for now. By this time, the tofu should be ready. Drain the water and put the tofu on a kitchen towel to dry a little bit. 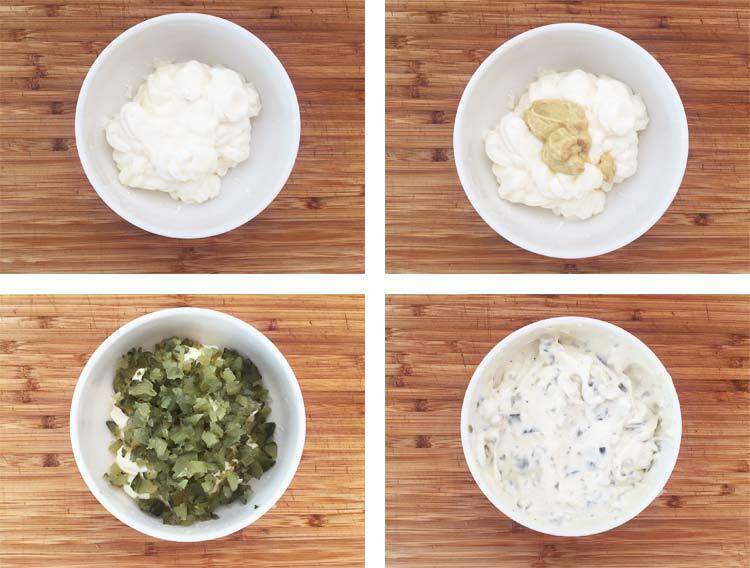 Take all the ingredients for the tartar sauce and whisk them together. Put aside. Heat up the peanut oil in a pan. You know the oil is hot enough when you drop some batter in and it starts to fizzle and turn brown in about 50 seconds. Dip a tofu slice in the batter and then carefully lower it into the oil. Let it fry until it's golden brown and then flip it over so that it's getting golden brown on the other side as well. Repeat this process with all the tofu. Take out the chips from the oven and serve together with the "fish", tartar sauce and some fresh green peas. This is GREAT! 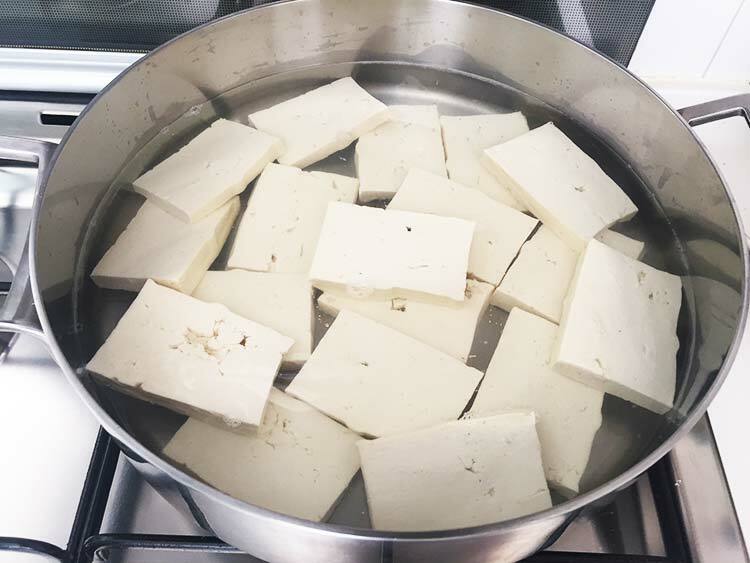 I have never prepared tofu this way before, and the texture was unique. Of course, it’s the breading that makes it such a hit – crispy and flavorful. I used very little oil for cooking. The only thing missing is a “fishy” flavor, which I know some people hate about fish. But, since I like it, I might add some seaweed – maybe in the boiling process? I’m happy to experiment since this became an instant favorite at our house! Thank you so much for this gem! Hi, and thank you so much for your kind words! To get the “fishy” flavour you could perhaps, as you say, either add some nori leaves in the boiling process or perhaps wrap the tofu in some before you fry it.